At the reception, the bride and groom will be at their own "sweetheart" table. The centerpiece for their table will be the bridal bouquet. I wanted candlelight like the guest tables, but something special for the bride and groom. So, I settled on "floating candles" for their table to bookend the flowers. The bargain hunter in me used the dollar store for the candle holders; you can't beat $1! In fact, Hobby Lobby, Michael's and JoAnn's charge about 3x as much for the exact same thing. The other goodies I purchased at Michael's. This was one of the easiest projects ever....and yet, the end result is just what I was hoping for. Not too much, but something unique for the newlyweds' table. One of the candle holders has their monogram, while the other is their wedding date. The centerpieces and candles for the guest tables are the autumn themed colors we have throughout the reception area; the bride and groom's table has the wedding white/ivory to set it apart. I have a couple other items to share, but they will have to wait...I want them to be a surprise! I've strolled past these vintage boxes at Hobby Lobby, Michael's and JoAnn's at least a half dozen times and finally stopped and gave it some thought yesterday when I was at Michael's. It dawned on me that one of these could be really fun for the gift table at my daughter's wedding. So, I picked up a sprig of silk magnolias and used that and a sprig of silk lilies of the valley that I had on hand and went to town hot gluing the little suckers into the inside of the box. I wrote their names and wedding date on the inside in black marker, went over it with a glitter glue pen....added a couple of stickers and I now have a beautiful custom treasure box to use on their gift table! My daughter was tickled and said they could use it later to keep treasures from the wedding (e.g., a "save-the-date", wedding invitation, bridal shower invitation, etc.). That was a nice plus that I hadn't considered, but made me feel good when she realized an added use for it! Yesterday, we also took care of the tuxes. Very productive day, no doubt. As a professional photographer, my daughter offers all types of services, from weddings to engagements to families to boudoir. Recently, she came home from a family photo shoot and was sharing the challenges of getting all the kids to focus on the camera at the same time. Add that conversation to something I recently saw in my intranet travels and I was inspired to help out with some fun lens covers to keep the little ones' attention. I let my imagination be the guide. There are two key pieces to this; the background/face area which is made of firm felt and the area that slides over the lens itself. For that, I used rib knit; the material you would use for the waistband/cuffs for a sweatshirt or maybe a jacket. That allows the cover to slide over the lens, yet firmly hold it in place. From there, I used pipe cleaners, plastic eyes, ribbon, and whatever else I thought might be eye catching and fun. I was having so much fun with this project, I just kept going and made three different varieties for her. When I put (yellow) the first one on the camera and showed it to my husband, I got a spontaneous smile from him. You need to understand how momentous that is - it is extremely RARE to get him to smile in pictures. I thought, well if it got him to smile, it will surely work on some kids! I'm happy to report she used them on a recent family shoot which included four kids; the oldest being five and they definitely helped her out. She captured some awesome expressions and it made her job a whole lot easier. That makes it all worthwhile for me. The last week was really crazed with preparations for my daughter's graduation party. With family coming to town and a luncheon planned for after the graduation ceremony on Saturday I had lots of cooking, baking and cleaning to conquer.....and, when I say cleaning, I mean the DEEP cleaning type like windows inside and out, ceiling fans, screen doors and the tops of the kitchen cupboards. WHEW!!! While I had intentions of getting pictures of the buffet tables, we were short on time after the "rain delay" of the ceremony and we had guests arriving while we were placing everything on the tables. The cool/damp weather forced us indoors, but the family and friends who arrived to celebrate brought us plenty of "sunshine". It was a great celebration. 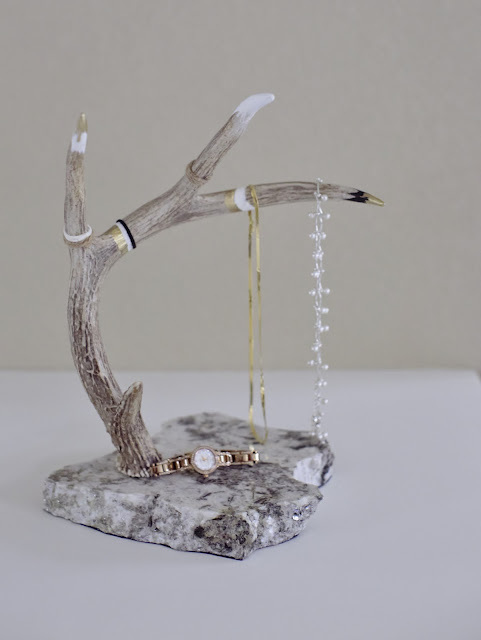 Here are a few things I pulled together for the party which I was able to capture the next day. I love mason jars....for both of these I used burlap and just had fun adding some lace, buttons, silk flowers and old clip on earrings from my Mom's jewelry box; add a spray of baby's breath and you have some great table decorations! The cake pops were a huge hit......I had just a couple leftover from the thirty something that I made. They looked cute arranged in the metal containers. I made some chocolate and butter pecan cake flavors and topped it with white and chocolate mint melts. Yummy!!!!! To me, the trick to great cake pops is to make sure you add the right amount of frosting to the cake; make them moist, but not too gooey. I use 1/2 of a baked sheet cake to 1/4 of a container of pre-made cream cheese frosting. Then have fun decorating...I had some other varieties like chocolate with white swirls and white with red sprinkles. JoAnn Fabrics and Hobby Lobby both have great choices for sprinkles and melts in their baking sections. I decided to make some menu item cards for the tables so the guests didn't have to "guess" what some of the goodies were. I used card stock and a fun font dafont.com; then used my pinking shears to cut the cards and added some fun paint designs. 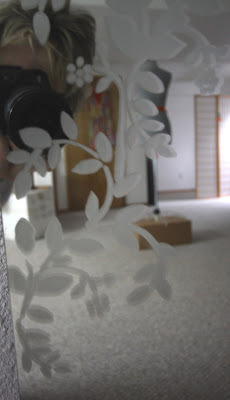 I've always wanted to try this, so I chose to use a plain mirror that will be hung in my sewing area (just in case this project didn't go quite as I had hoped). I'll be happy to show you the results and share what I learned in case you want to attempt this in the future. It was challenging to get a good picture since the overhead lights created glare and without lights it was a bit dark.....plus, I knew you didn't want to see my mug in the picture, so here is the end result. Hopefully, you get the gist of the finished product. Now maybe one of the reasons I put this off as long as I did is if you read the label on the "Armor Etch" goop, it would all but suggest you have your will in order and notify your next of kin prior to beginning your project. It reads: wear long sleeves, rubber gloves, don't inhale, ensure adequate ventilation, wear eye protection, what to do if you get the solution in your eye, etc., etc. Wow!! Really? Setting aside my trepidation, I forged ahead. Call me Captain Fearless! The consistency of the product is like a thick paint versus a paste. I was able to apply it easily enough with a sponge brush. 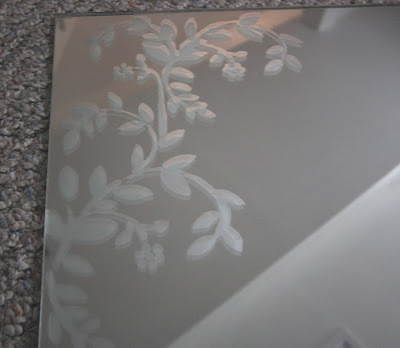 Since I purchased a standard stencil that you would use for other types of stenciling projects, I did get a bit of seepage and the fine lines such as stems were difficult to achieve. If I were to etch a glass or candle holder for example, I would definitely look to see if they have any etching stencils that might work. 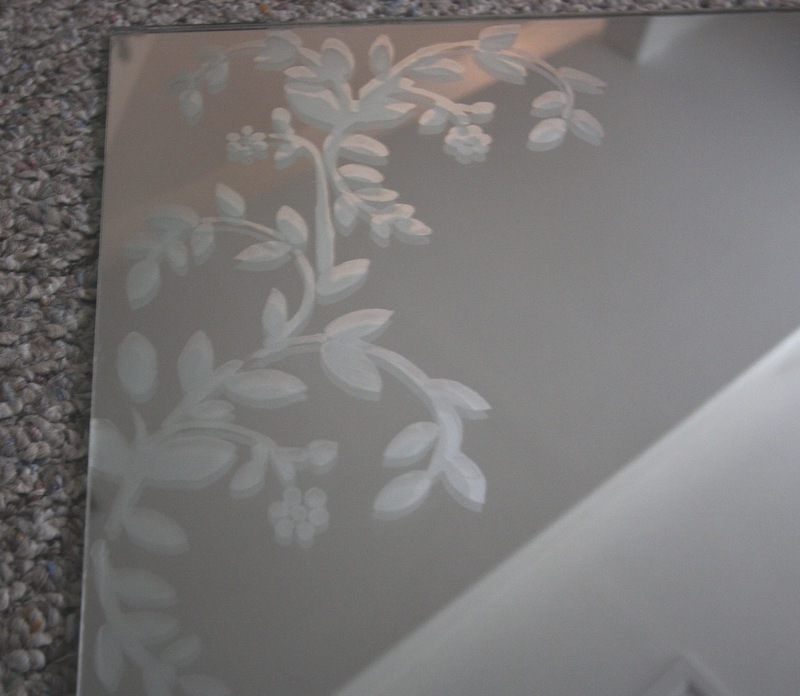 The etching stencils can be adhered to the surface since they have a self adhesive backing; this would definitely help to prevent any seepage.